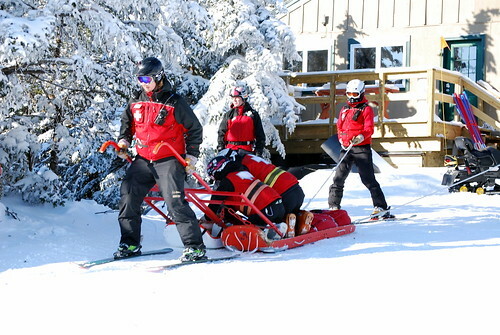 On Sunday, October 18th, Mount Snow Ski Patrollers as well as other local emergency health care professionals will be participating in a full blow Mass Casualty Incident (MCI) Drill. On Sunday afternoon, Mount Snow Ski Patrollers, in coordination with local rescue squads (EMS) will be participating in a Mass Casualty Incident Training that would require coordination of of all area ambulance services, the resources of Brattleboro Memorial Hospital and Southern Vermont Medical Center in Bennington, Hellicopter crews from Albany and Dartmouth, and local bus & shuttle services (the “Moover”). This is an unprecedented exercise for Mount Snow Rescue, and invaluable for our confidence in being as prepared as possible for a catastrophe. This will be fully simulated, patients in moulage, packaged and carried from the hill, transported by ambulance to local hospitals where they will be received by nurses and doctors. Some of us will be on those rides providing care, some of us as patients.